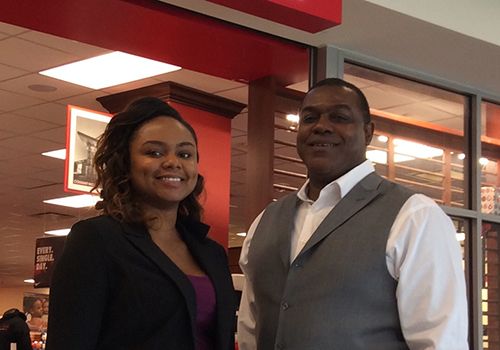 Desiree Hightower poses with General Manager Felix Robinson at the Barnes & Noble at the University of Houston bookstore. 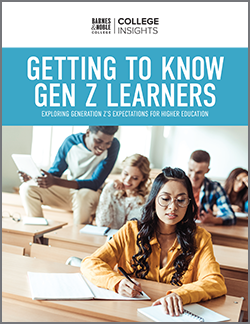 Seeking part-time employment to help offset costs associated with college or as a means for funding living expenses may be what motivates some students to take a job while attending school. For three particular student booksellers working at the Texas Southern University (TSU) Bookstore and the Barnes & Noble at the University of Houston bookstore, that part-time work has lead to full-time careers. For recent graduate, Desiree Hightower, working at her college bookstore not only helped to meet financial obligations while attending school, but also paved the way to a promising career – doing a job she loves. A 2014 graduate of Texas Southern University with a degree in Business Management, Hightower began working as a temporary student bookseller as a freshman. After graduation, she was successfully placed into a permanent full-time position as Assistant Merchandise Manager at the Barnes & Noble at the University of Houston Bookstore, then, quickly promoted again to Department Manager for Store Operations. 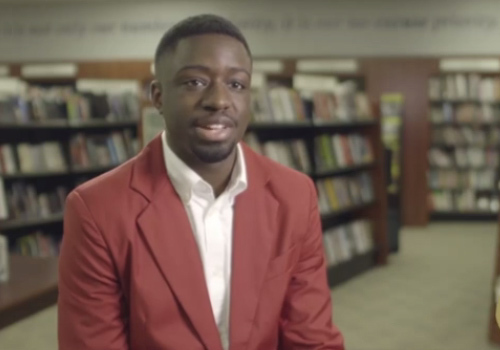 Another promising bookseller and current senior at the University of Houston is Jamal Hicklen, who is currently enrolled in the Bestseller Program, a management development track for employees recognized for their high potential. As a Corporate Communications major, minoring in Business Foundations, Hicklen’s future aspirations are to become a corporate attorney; however, he plans to continue to work for Barnes & Noble College as a department or assistant manager after graduation, while he attends law school. Jamal Hicklen, a senior studying Corporate Communications at the University of Houston, is enrolled in the Bestseller Program, a management development track for Barnes & Noble College employees recognized for their high potential. Since the fall of 2013, Hicklen has worked as a student bookseller in various capacities. Bookstore General Manager Felix Robinson has shown Hicklen how the bookstore can help pave the way to his future endeavors. “It’s interesting to see how what I learn in my classes can easily be applied to what I do on a day-to-day basis at the store,” said Hicklen. A short 25-minute walk west brings you to the Texas Southern University Bookstore where current senior Roneka Woodard is majoring in Radio Television and Film (RTF), and minoring in Entertainment Recording Management. Woodard, under the tutelage of Manager James Burch, is also part of the Bestseller Program, and who, according to Burch, takes her job very seriously. Texas Southern University senior Roneka Woodard is majoring in Radio Television and Film (RTF), and minoring in Entertainment Recording Management. Woodard is also part of the Bestseller Program at the campus bookstore. Woodard has been enrolled in the management development track for about nine months and is already embracing her new role. In preparation for freshman orientation this fall, Woodard knew she wanted to do something big. So when she presented her idea to have a backdrop made so students could take ‘selfies’ to let friends and family know they were at Texas Southern, Burch let her to run with it. “I wanted them to be comfortable getting information they needed and to have fun,” said Woodard. 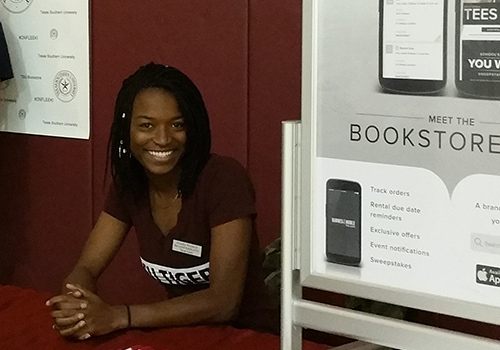 She set up a table, complete with props, and made herself available so students could learn more about the bookstore, answer questions about financial aid and encouraged them to download the bookstore app. Texas Southern has received outstanding sales achievements two years in a row at Barnes & Noble College’s Annual Meeting, and ultimately, that means the store is a busy one. Through his lively personality and dedication to the student employees who work for him, Burch says he works hard at using positive reinforcement with his booksellers. While 80 percent of Barnes & Noble College student booksellers will be with the company a year from now, nearly 70 percent will stay for the long run. 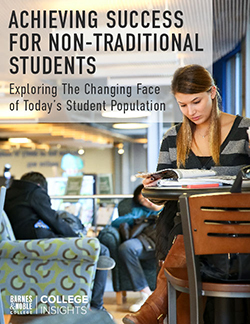 The program provides guided benchmarks for Bestsellers to master a variety of skills and learn about the internal operations of the bookstore, but the most valuable areas of personal growth experienced by all three were their improved communication skills and new-found confidence gained to effectively engage with co-workers, customers and the campus community. Cultivating a collaborative work environment takes great leadership, and University of Houston’s Robinson, recently recognized by the company with a Campus Leadership Award, leads by example. “I want them to understand the mission of the company and share in the importance of developing relationships on campus,” he said. I want to apply for a retail position at SPC Tarpon Springs Florida but cannot find the application process. Can you please help me? We apologize for not getting back to you sooner. If you would like to apply to work at the St. Petersburg College – Tarpon Springs, please visit our Career Page on bncollege.com, search for your school, and apply online. Here is a direct link to the Barnes & Noble College career page for your convenience.